Wigan boss Steve Bruce fears Emile Heskey will be out for weeks after the striker suffered an ankle injury in the 5-3 thriller against Blackburn. 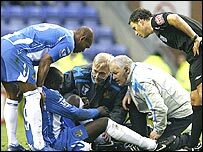 Heskey, who has only just returned from surgery on his foot, was carried off on a stretcher shortly before half-time following a clash with Steven Reid. "I can't see Emile being fit for the next few weeks for sure," said Bruce. "He has gone over badly on his ankle and he is on crutches as we speak and we hope he is not going to be too bad." For Bruce, the England striker's injury took the edge off Wigan's first win in 14 games. Marcus Bent, who is on loan from Charlton, scored a hat-trick as the Latics held off a Blackburn comeback to seal victory at the JJB Stadium. "We all know the importance of Emile," added Bruce. "He is a big, influential player for us. He will have a scan and X-rays in the next 24, 48 hours." The former Birmingham manager said he hoped Bent would be able to fill the gap. "Marcus has been terrific by all accounts since he's been here," said Bruce. "He was very, very good against Man City. I thought he and Heskey played very well at Bolton last week. "He's worked extremely hard and led from the front, so he'll need to do that again, especially if we have lost Emile."